Welcome to the second and final installment of celebrate Hanukkah without frying (or, at least without frying in your own kitchen). 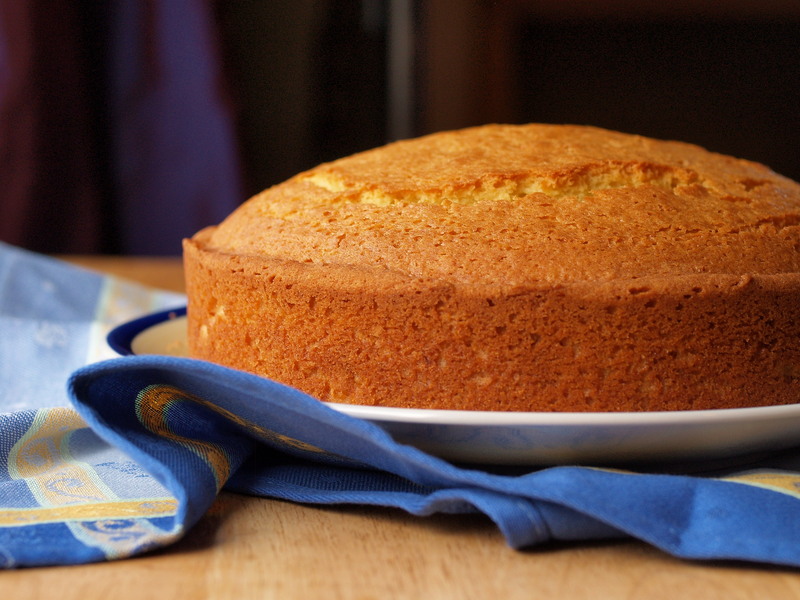 Someone asked me yesterday which extra virgin olive oil I used for the cake, and, lo, I had forgotten to mention it in my post. 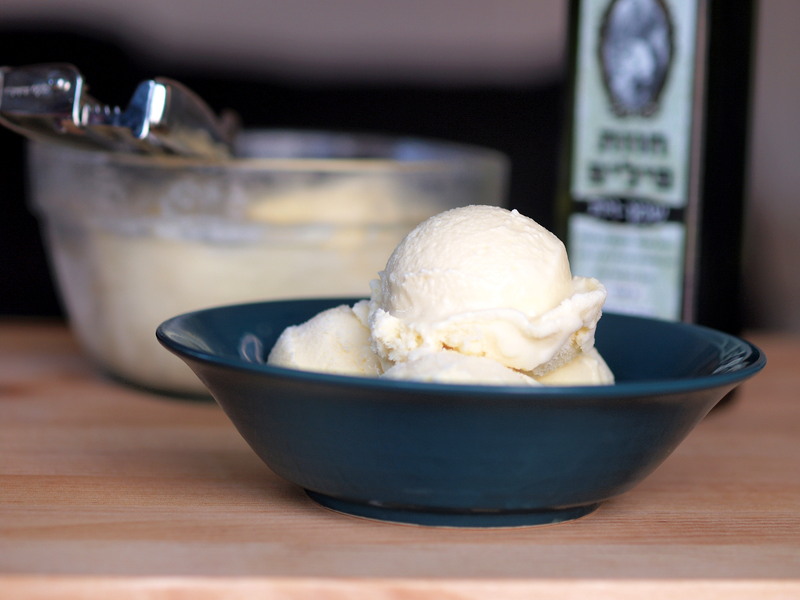 For the recipes (yes, recipes – today we get ice cream), I used a delicate Israeli oil from Havat Philip in the Negev. A more universally easy-to-find oil that would work great in these recipes is Unio, a Spanish extra virgin made from Arbequina olives with a low 0.2% acidity). It has a slightly more assertive flavor without too much kick, an olive oil that really tastes like olives. The two other extra virgins that I mentioned buying in the grocery store felt too peppery for sweets. The first, Olympic, is made from Kalamata olives with a slightly bitterness and a peppery finish. Some people describe peppery oils as one-, two-, or three-cough oils. This one is a two-cough. The Italian, Di Molfetta Frantoiani, is very mild at first but has a real kick at the end – it’s a three-cougher. I’m saving these two for salad dressing and bread dipping. 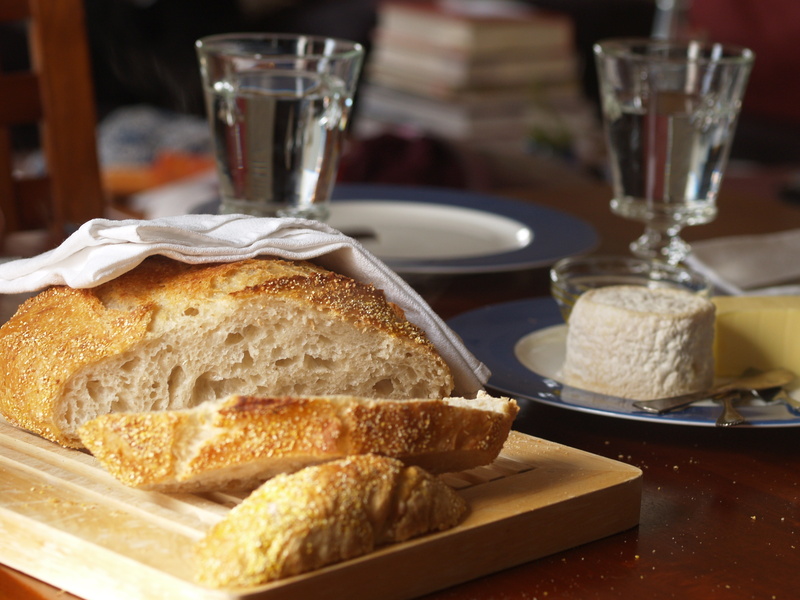 This recipe is from Dorie Greenspan’s Around My French Table. Making ice cream does require a lot of pots, bowls, spoons, and whisks, but you don’t need an ice cream maker. Instead, freeze the custard in a shallow pan for a few hours and periodically give it a whir with an immersion blender. For other tips on making ice cream by hand, check out what David Lebovitz, ice cream aficionado, has to say on the subject. Prep. Fill a large bowl with ice and water, and keep in the refrigerator. Set a strainer over a slightly smaller heatproof bowl (you’ll be pouring the cooked custard through the strainer). If you have a candy thermometer, this is a great time to get it out. If you don’t have one, that’s OK too. Boil. Bring the milk and cream to a slow boil in a large heavy-bottomed saucepan. Once you see some bubbling around the edges, turn the heat down to medium and follow the “cook” step below. Whisk. While the milk and cream are heating, whisk the yolks and sugar in a large bowl until very well blended and just slightly thickened. I did this by hand. Keep whisking and slowly drizzle in 1/3 of the hot liquid – you want to do this very slowly to avoid cooking the eggs. (In case some of the eggs do get cooked, you’ll strain them out later, so all is not lost.) I placed the bowl on a towel to keep it from wiggling around while I whisked with one hand and poured with the other. Once the eggs have acclimatized to the heat, you can pour the rest of the liquid in more quickly. Add the salt and whisk to incorporate. Cook. If you have one, clip the thermometer to the side of the saucepan and pour the mix back in. Cook the custard over medium heat, stirring constantly with a wooden spoon or silicone spatula, and making sure to get into corners of the pan. Stir until the custard thickens slightly and coats the back of the spoon: run your finger down the back of the spoon – if the custard does not run back into the track your finger leaves behind, it is ready. If you have a thermometer, it should reach 170°F but no more than 180°F. Strain. Immediately remove the pan from the heat and pour the custard through the strainer into the bowl. Throw out whatever remains in the strainer. Whisk again. Add the olive oil and vanilla and whisk vigorously. Chill. Remember that large bowl of ice water you put in the fridge? Take it out and set the bowl of custard over the ice, making sure that no water overflows into the custard. Put the bowls in the fridge and stir the custard every half hour or so until the mix is cold (about 2 hours). Freeze. If you have an ice cream maker, churn according to the manufacturer’s directions. If not, pour the chilled mix into a large bowl and place in the freezer (you might need to clear out some room first). It will begin to freeze from the edges. After 45 minutes, remove the bowl from the freezer and mix it with a whisk or use an immersion blender to break everything up. Repeat this every 30 minutes. It will take about two to three hours to full freeze. Serve. Take the ice cream out of the freezer ten minutes before you plan to serve it to allow it to soften. 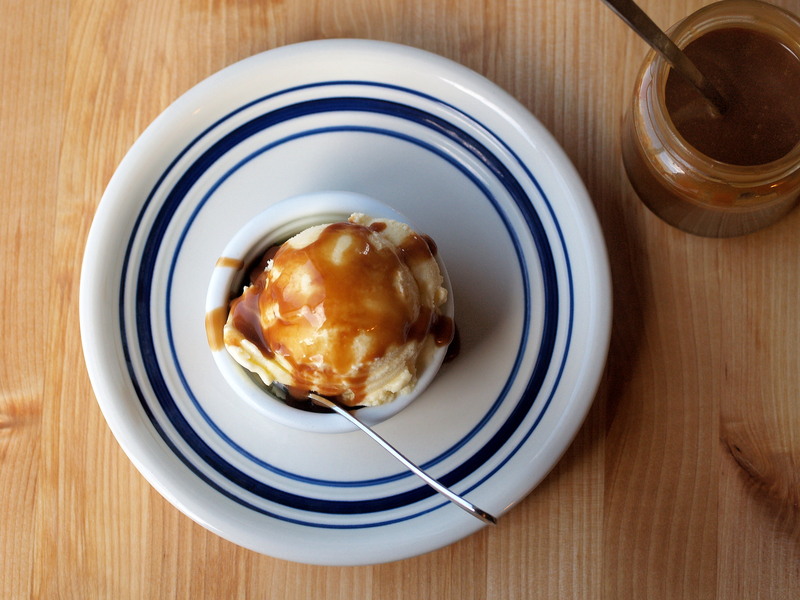 Of course, what goes great with olive oil ice cream? 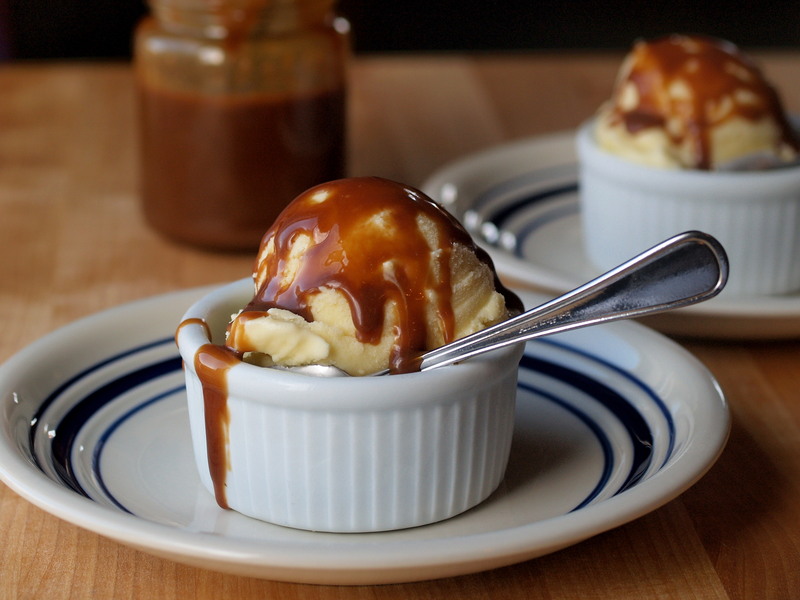 Balsamic caramel! I added two tablespoons of balsamic vinegar to a basic caramel sauce recipe from Simply Recipes. Make sure to use a large saucepan, at least 2 quarts, because when you add the butter and cream the mix will bubble vigorously and foam up to the top of the pan. Prep. Before you get started, you should get the ingredients measured out because you don’t want to fuss with things while you have hot sugar bubbling on the stove, threatening to burn. Melt. Over medium-high heat in a heavy large saucepan (2 quarts or larger), heat the sugar. Once it starts to melt, whisk it until all the sugar has melted, comes to a boil, and turns amber. Then add the butter and continue to whisk until all the butter has melted. Bubble, bubble, toil and trouble. Once all of the butter is mixed in, take the pan off the heat. Slowly pour the cream into the pan, continuing to whisk. This is when the mix will bubble and foam to the top of the pan, so be careful. Whisk until the caramel sauce is smooth, and then add in the balsamic and salt. Cool. Pour into a glass jar to cool at room temperature. Happy Hanukkah, folks. Have you had your latkes yet? Your sufganiyot? If so, let’s try something different. Cake! At the Hazon Food Conference last week, my friend Leah taught a cooking class on fried Hanukkah foods from around the world. We made perashki kartoskagi (Bukharian potato turnovers) with tamat (fresh tomato sauce) and frittele de riso (Italian rice fritters). I helped man the fry station — you should have seen me trying to figure out how to use an industrial oven. We staved off the fire alarm for a full twenty minutes. I still smell like fried. This year, I left the latkes to the experts, opting to cook and bake with olive oil rather than fry with it. Faced with which extra virgin olive oil to buy, one that would really shine in the recipe, I stood in the store for almost half an hour. I had no idea how to decide between the different varieties. So I guessed and came home with two different bottles – a Greek one for authenticity and a well-known Italian one just in case – and set up a tasting, throwing an Israeli one from my cabinet into the mix. The Greek was too peppery, the Italian too mild, the Israeli just right. And then I researched how to choose a good extra virgin olive oil. It’s actually much more complicated than I thought, and there is significant fraud in the industry*. The gist? That “extra virgin olive oil” you just put in your cart might not be extra virgin, and in fact might not even be olive oil at all. Certification symbols are a good starting point. They indicate that an oil was properly made, for example demonstrating adherence to national or state olive oil association standards or conveying Protected Destination of Origin (“PDO,” or “DOP” in Italian) status confirmed by quality control committees overseeing production processes. Or course, just like kosher certification agencies, the symbol is only as reliable as the organization behind it. Second, providing notation of acidity level is another positive, even better if the acidity is well below the 0.8% standard. Further, good olive oils report the processing or pressing and best-before dates. Finally, always choose a dark bottle over a clear one, as light exposure causes oil to go rancid. There are several online sources listing reputable, high-quality extra virgin olive oils (links below), including some sold in mainstream grocery stores. Once you’ve hit upon your favorite oil, you’re ready to get cooking. A few fun holiday links I think you’ll enjoy. Traditional vs innovative latkes? Two chefs duel. I think the wrong one won. A conversation with Max and Eli Sussman, co-authors of This is a Cookbook, including the recipe that Eli made in the video. An electronic advent calendar with holiday cookies behind each door? Why yes! No peeking, guys, no peeking. 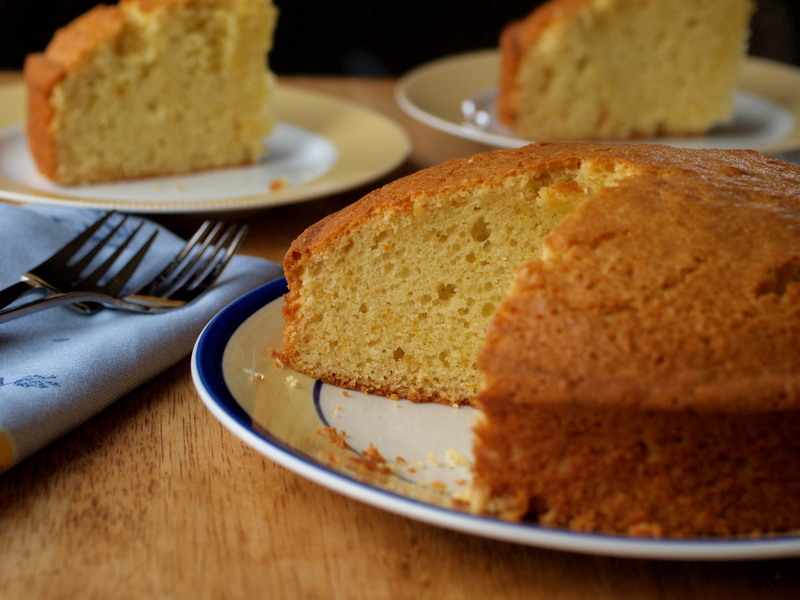 This recipe is adapted from Food & Wine magazine and I think it is one of the best cakes I have ever made with its moist crumb, crackly top, and aflash of citrus to complement the fruity extra virgin. You can use any orange liqueur you’d like – I chose Cointreau. Or you can go the lemon route and use limoncello (replacing the orange zest with lemon and the orange blossom water with vanilla). For a non-dairy option, substitute full fat, unflavored almond or soy milk. 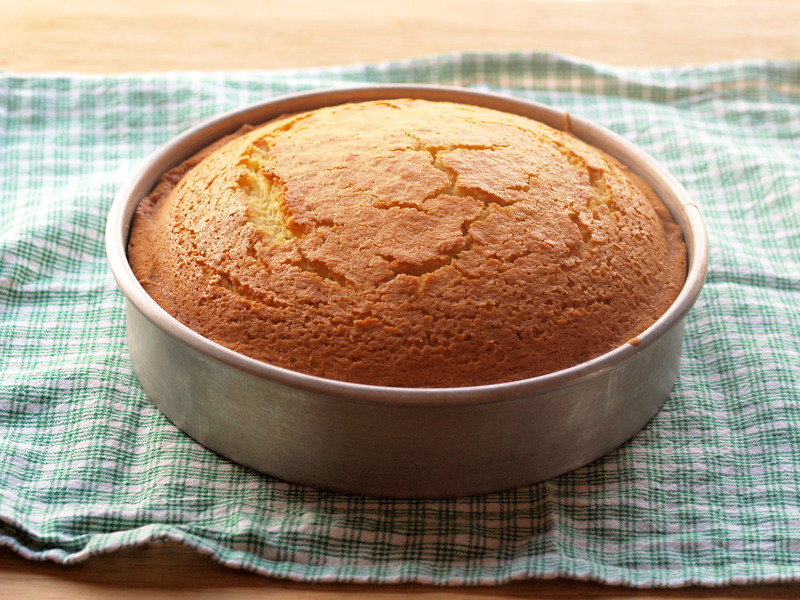 The original recipe had a hefty 1 ¾ cup sugar which I reduced to 1 ¼ cup – the cake is still quite sweet. 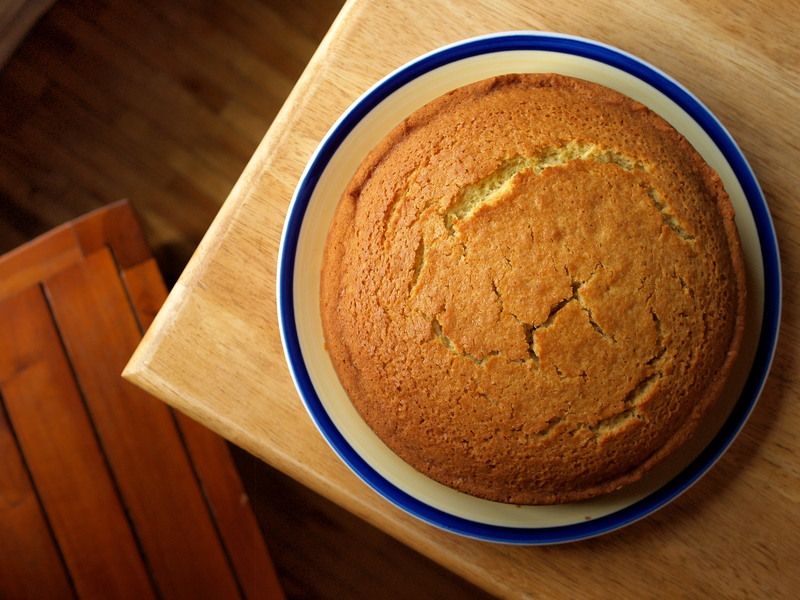 The recipe also called for a 10-inch round cake pan which I didn’t have, so I used a 9-inch round instead. The batter filled the 2-inch high pan about ¾ of the way up and rose a lot during baking, reaching the top of the pan at the edges and at least an additional inch above that in the middle. If it looks like your pan won’t be big enough for all of the batter, leave some out and make a few cupcakes. Prep. Preheat the oven to 350°F. Cut a piece of parchment to fit into the bottom of a 9- or 10-inch round cake pan. Mix. In a bowl (I use a stand mixer), whisk the eggs and sugar together until thick and yellow, 2-3 minutes. Add the oil, milk, orange blossom water, zest, and liqueur. Continue to whisk until everything is mixed. Add the flour, salt, baking soda, and baking powder and use a spatula to fold in the dry ingredients until just combined. Cool. Let the cake cool in the pan, about 30 minutes. Run a knife around the edge of the pan and then invert the cake over a rack, peeling off the parchment. Let the cake cool completely, about 2 hours. Hey there! Today we’re having soup. 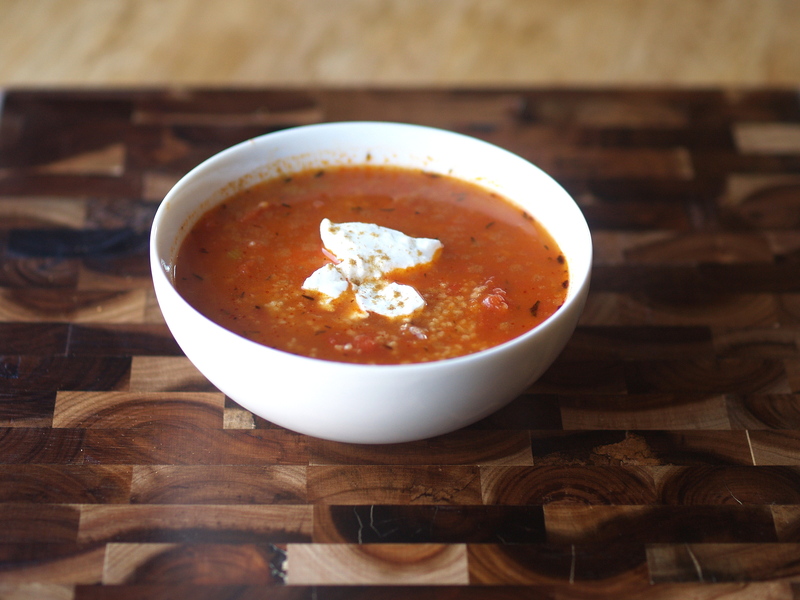 It’s a simple tomato soup thickened with couscous, spiked with spices, dolloped with yogurt. I’m going to level with you – the first bowl didn’t wow me. It was too thin. The couscous seemed like an afterthought. The cumin and thyme competed with one another. So I left the pot on the counter to cool and went out to work on breaking in my new hiking boots (Machu Picchu, here I come!). But a few hours later, I stuck a spoon in the now cold soup to see if maybe I had missed something. Wow! While it sat, the couscous did its thing. As it absorbed the liquid, it thickened the broth, it united the spices. I should have known it would all come together. Yotam Ottolenghi wrote the recipe. Adapted from Yotam Ottolengi’s Plenty. I replaced the semolina with cooked couscous because I had some left over after making a tagine. If you don’t want to make couscous separately, I suspect that you can add uncooked couscous during the last ten minutes of cooking (which is how the recipe directs you to add semolina). Make couscous. I’ve had good luck with this method, or just follow the directions on the package. Or add uncooked couscous later. Chop. Finely chop the onion and celery. Sauté. Heat the olive oil in a medium pot (I used a 4-quart). Add the onion and celery, and sauté over medium heat until the onion is golden and soft, about 8 minutes. Stir in spices and tomato paste until incorporated. Crush. Crush the tomatoes between your fingers into bite sized pieces and add to the pot. Stir and season with salt and pepper. Simmer. Add the water and sugar and bring to a boil. Then turn the heat down and simmer uncovered for 20 minutes. Stir in the cooked (or uncooked) couscous and simmer for another 10 minutes. Cover the pot at this point if you opted for the uncooked couscous. The couscous will absorb some of the liquid, so don’t worry if it starts out looking thin. If the soup gets too thick (more likely if you added uncooked couscous), add water until you get the right consistency. Serve. Squeeze in the lemon juice and taste for salt and pepper again (I found the soup needed quite a bit of salt). Ladle into bowls and spoon some Greek yogurt on top. Sprinkle with cumin. I’m still savoring the New Yorker December 3, 2012 food issue, nursing it like a café au lait in a bowl so large you get to warm up both hands as you lift it to your lips. The issue itself is comforting, inviting, lingering-inducing. You may have caught a glimpse of it sprawling across my table next to my salad earlier this week. The article that’s on my mind now is one about young French female CEO Apollonia Poilâne, her business, her traditions, and her bread. Of course, it’s not really her bread, but her family’s bread, a legacy started eighty years ago in Paris by her grandfather Pierre Poilâne and their first eponymous bakery. And, one might argue that it’s not really her family’s bread, but France’s bread. Poilâne‘s signature miche, a 4-pound round loaf with a mild sourdough flavor, is often sold by the half, sliced in long tranches for tartines (open-faced sandwiches). In fact, the term pain Poilâne has become synonymous with sandwich bread (like the British term Hoover for vacuum). 1) Bread should not steal the quality of the meal. 2) I don’t believe in making bread at home. 3) It’s terribly wrong to eat bread while it’s still cooling. And so I planned a meal in which the bread was the centerpiece, placed squarely in the middle of the plate with just a few adornments. Butter, honey, Chevrot, olive oil, salt. 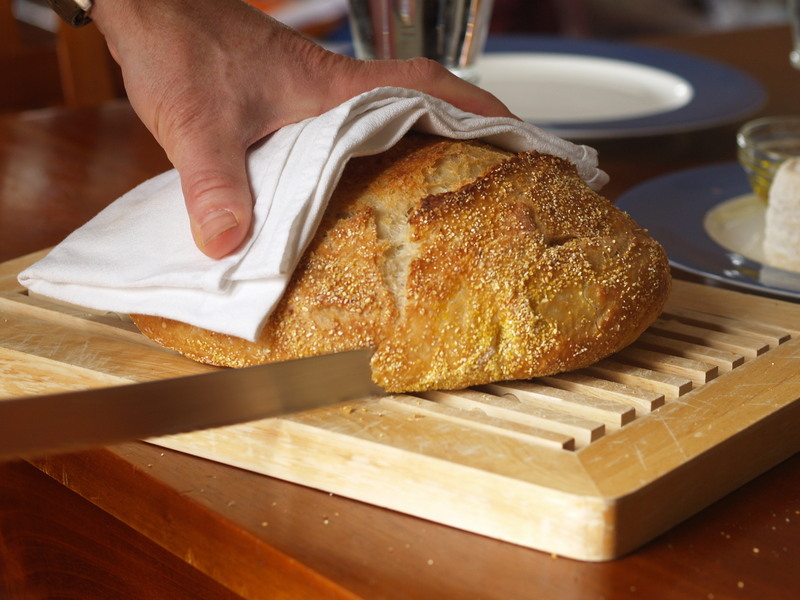 When we took the bread out of the oven, flipping it from the pot to the cutting board, we leaned in to hear the murmuring of the crust – microscopic cracks forming as the bread cooled and contracted. In Appolonia’s words, ça chante, it sings. 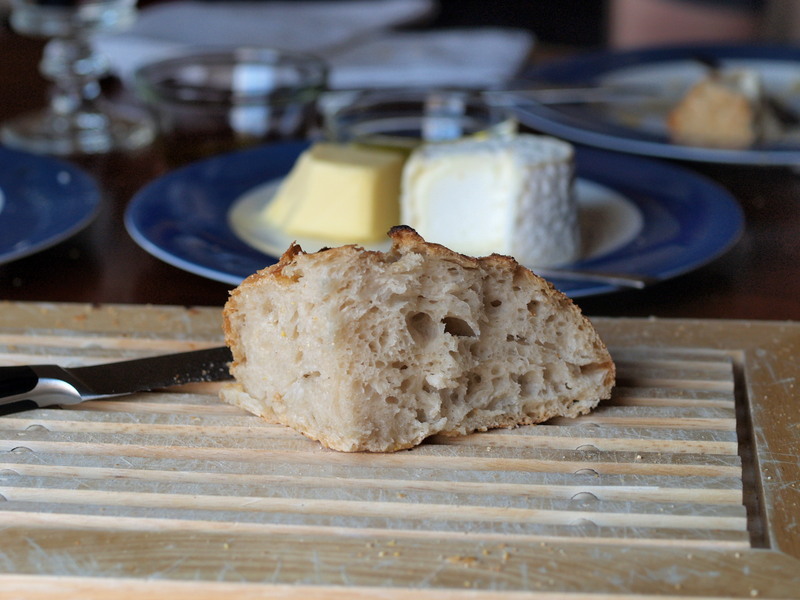 We couldn’t wait for the bread to cool, and as we made the first cuts, the steam filled our noses, the rich scent of … bread, but really the feeling of home. We tore the first naked slice in half, chewing it, thoughtfully, entranced. 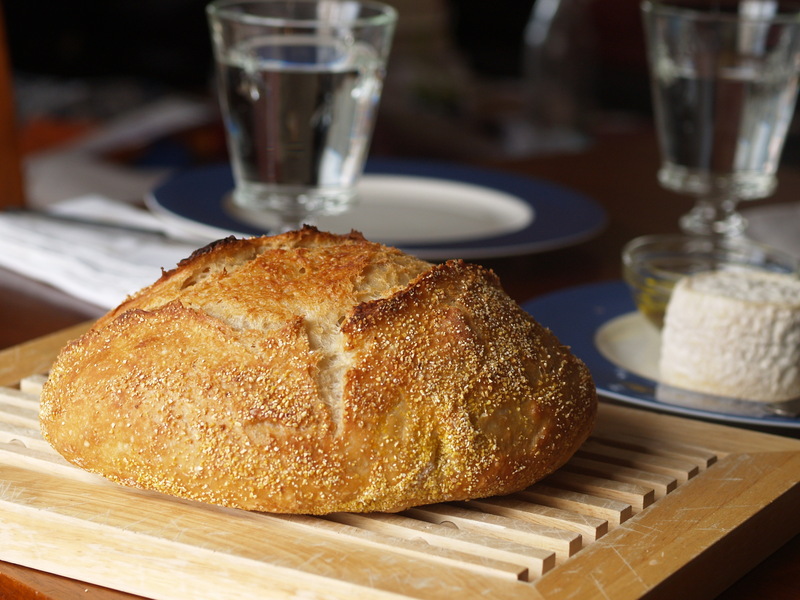 Jim Lahey’s no-knead bread There are two very similar versions of the recipe – the one on the Sullivan Street Bakery site and the one that Mark Bittman published in the New York Times. I added a little extra yeast and salt – next time I’d add more salt. 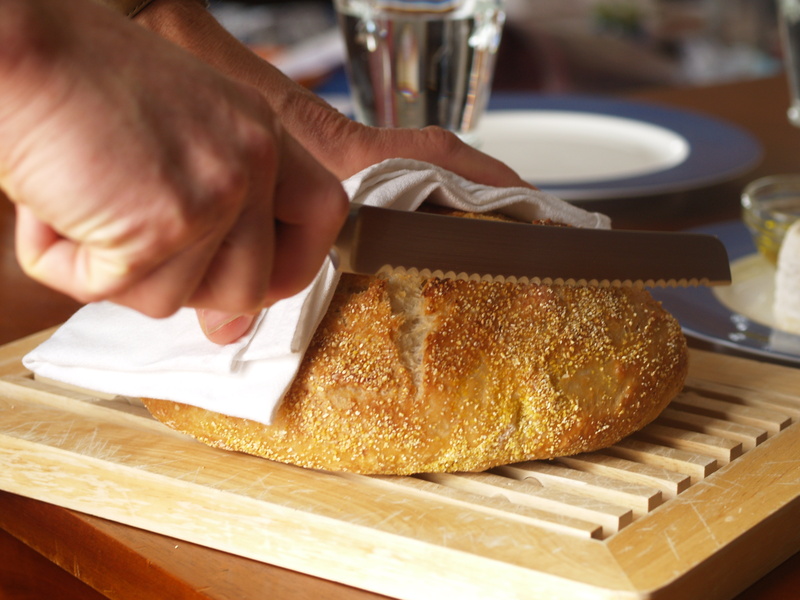 While there is very little work that goes into making the bread, it does require a lot of time, so you do need to plan in advance. The whole process from start to finish – mixing, two rises, baking – takes 15 – 21 hours. I like to start the dough the afternoon before, give it an 18-hour first rise, and then bake the bread around 11 am in time for lunch. If you want to cut down on time, check out this video that recommends adding red wine vinegar (!) to the mix. Here are a few lessons that I learned along the way. Make sure you have a heavy pot with a tight-fitting lid. I use a Le Creuset cocotte (French oven). The standard black knob that comes with the pot can’t sustain the high heat required; either replace it with a stainless one or remove the knob and fill the hole with some aluminum foil. The first time I made the bread, I used a covered tagine whose loose-fitting top not only let the steam out, but cracked when I removed it from the oven. Don’t fuss with the dough. Refrain from peeking at it, lifting the plastic, kneading, or poking too much to check its rise. I put the bowl on top of the refrigerator to help me resist temptation. The most difficult part of the whole recipe is transferring the dough into the hot pot. You want to do this quickly so you can cover the pot and get it back into the oven as fast as possible. I found that this was easiest when I placed the tea towel holding the dough on a cookie sheet so that I could let the dough tumble into the pot. Stir. In a large bowl combine flour, yeast and salt. Add water, and use your hands to stir everything around until blended. 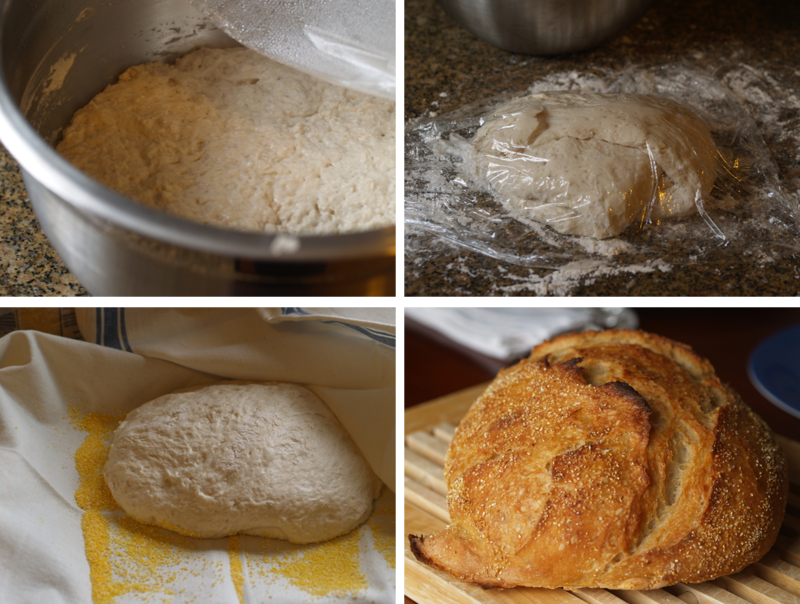 The dough will be very wet and sticky and will look shaggy – messy and scruffy and unkempt. Rise. Cover the bowl with plastic wrap. Let dough rest at least 12 hours, preferably 18, at warm room temperature, about 70 degrees. The dough is ready when its surface is dotted with bubbles. Rest. Lightly flour your counter and roll the dough out on it in a jiggly mass. Sprinkle the dough with a little more flour and fold it over on itself once or twice. Cover loosely with plastic wrap (right on the counter) and let it rest for 15 minutes. Rise again. Using just enough flour to keep the dough from sticking to the work surface or to your fingers, gently and quickly shape the dough into a ball. Generously coat a cotton towel (not terry cloth) with cornmeal (or flour or wheat bran). Put the dough seam side down on the towel and dust with more cornmeal (or flour or wheat bran). Cover the dough with another cotton towel and let rise for about 2 hours. When it is ready, the dough will be more than double in size and will not readily spring back when poked with a finger. I placed the dough and towels on a cookie sheet and placed the whole thing on top of my refrigerator. Heat. At least a half-hour before dough is ready, heat the oven to 450ºF. Put a 6- to 8-quart heavy covered pot (cast iron, enamel, Pyrex, or ceramic) in oven as it heats. If you’re not sure which of your pots to use, go with the larger one – the bread is beautiful when it’s shaped free form. Transfer. When the dough is ready, grab your oven mitts and carefully remove the pot from oven. Slide your hand under the towel and turn the dough over into the pot, seam side up. There will be some cornmeal on what is now the top. It will look like a mess, but that’s OK. Shake the pan once or twice if dough is unevenly distributed; it will straighten out as it bakes. Bake. Cover with lid and bake for 30 minutes, and then remove the lid and bake another 15 to 30 minutes, until loaf is browned. Cool. Cool on a rack for at least 15 minutes. The cooler the bread, the easier it will be to cut. If you can wait that long. Hi there. Just a quick hello and a recipe today. Last week, I promised you bread. Um, here’s some salad. It looks a little like this salad. And, well, this salad too. I made it for a friend’s birthday and after we ate dessert as our first course (hey, it’s a birthday!) it was, hands down, everyone’s favorite dish. More on that dinner and that first course cake soon. But for now, again and from a different angle, here’s some salad. 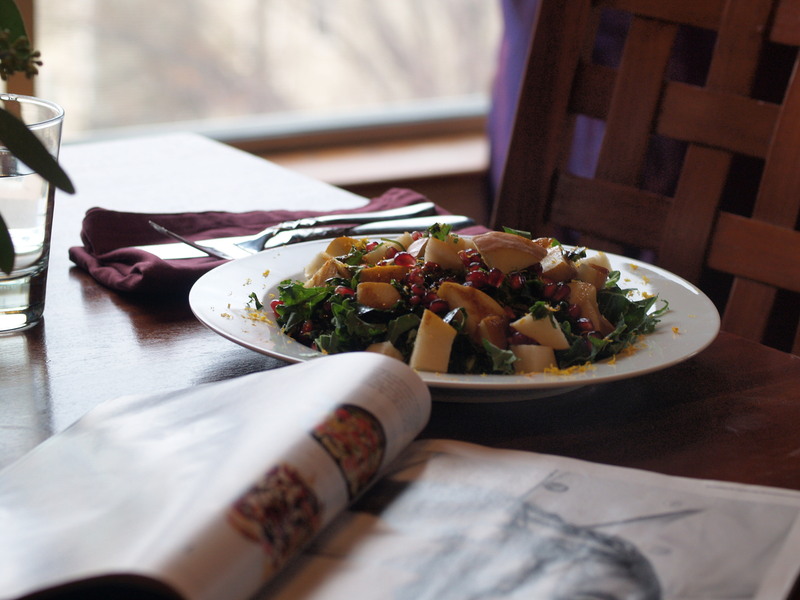 Kale and pear salad with pomegranate gremolata This salad is based on an arugula and watercress salad in last month’s Food & Wine. It’s a great combination of bitter, sweet, and sour. 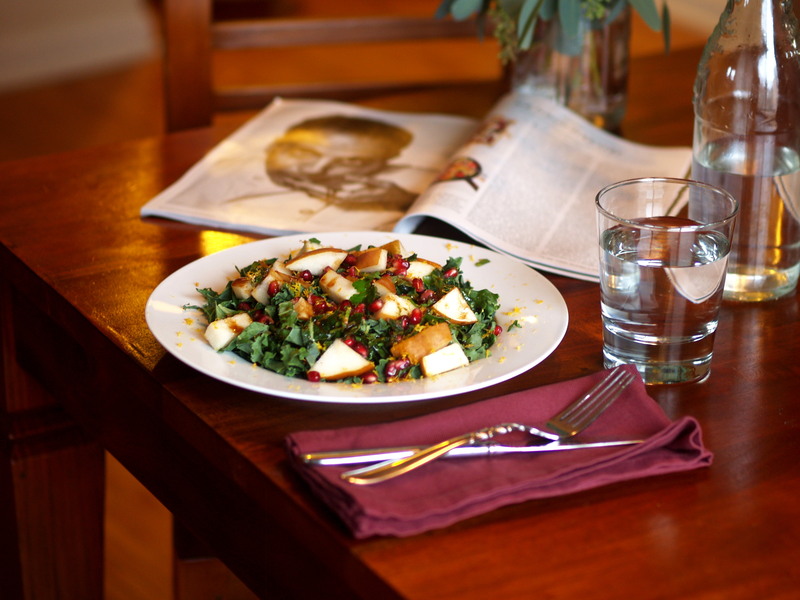 And a great combination of textures – the crisp juicy pears, the pop of the pomegranate arils, the chewy kale. Make sure to toss the greens with half the vinaigrette about 30 minutes before serving so that it will start to wilt and absorb the flavors. You probably will have some leftover vinaigrette. Gremolata is an herb mix, usually lemon zest, garlic, and parsley, and traditionally sprinkled over osso bucco. The zest and parsley give any dish a really bright flavor; I like how Food Lover’s Companion puts it: “It’s sprinkled over … dishes to add a fresh sprightly flavor.” Sprightly, yeah, that nails it. If you don’t want to dirty another bowl, feel free to sprinkle the gremolata ingredients over the salad after you’ve dressed the greens rather than mixing everything separately. Next time, I’ll peel and segment the oranges and add them to the salad too. Slice. Fold each kale leaf in half and cut away the stems. Working in batches of several leaves, stack the leaves in a pile, roll them like a cigar, and slice the leaves crosswise into thin ribbons. Cut the pear into bite-sized pieces. Assemble. Scoop the kale into a large bowl and add half the dressing. Toss the leaves and let them sit for a half-hour. Right before serving, sprinkle with the pears and gremolata. Drizzle with more dressing to taste. Whisk or shake. In a bowl or jar, add all the ingredients and whisk or shake to emulsify. Add salt and pepper to taste. Seed. Remove the arils/seeds from the pomegranate. I usually cut the pomegranate in half and tap the skin with a wooden spoon over a bowl of water (the seeds sink and any white pith floats to the top) but if you want to get every last seed, check out these detailed instructions. Chop. Finely chop the parsley leaves. Mince the shallot. Mix. In a small bowl, mix together the pomegranate seeds, parsley, and shallot. Zest the orange into the bowl and toss again.